Talk-show host Jimmy Fallon was announced as the host of the ceremony on August 2, 2016. Meryl Streep was announced as the Cecil B. DeMille Lifetime Achievement Award honoree on November 3, 2016. The nominations were announced on December 12, 2016, by Don Cheadle, Laura Dern and Anna Kendrick. La La Land won all seven awards for which it had been nominated, becoming the most successful film in Golden Globe Awards history and seventh overall to win each award for which it was nominated,[N 1] including Best Director, Best Screenplay for Damien Chazelle and Best Motion Picture – Musical or Comedy. The only other film to win more than one award was Elle, which won both the awards for which it had been nominated. Atlanta, The Crown, The Night Manager, and The People v. O. J. Simpson: American Crime Story were among the television shows that received multiple awards. The nominees for the 74th Golden Globe Awards were announced on December 12, 2016. Anthony Anderson – Black-ish as Andre "Dre" Johnson, Sr.
Riley Keough – The Girlfriend Experience as Christine Reade / "Chelsea Rayne" / "Amanda Hayes"
Jimmy Fallon opened the ceremony with a long homage to La La Land, with cameos from Nicole Kidman, Amy Adams, Ryan Reynolds, Tina Fey, Justin Timberlake, and others. His opening speech was marred by a brief delay after his teleprompter broke. Meryl Streep, recipient of the Golden Globe Cecil B. DeMille Award, used her acceptance speech to criticize, without stating names, President-elect Donald Trump's alleged imitation of disabled New York Times journalist Serge F. Kovaleski, stating: "Disrespect invites disrespect. Violence incites violence. When powerful people use their position to bully we all lose." 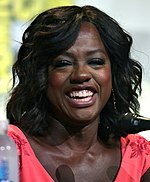 On the subject of diversity in Hollywood, Streep said, "Hollywood is crawling with outsiders and foreigners, and if we kick them all out, you'll have nothing to watch but football and mixed martial arts, which are not the arts." Press coverage of the event has largely focused on Meryl Streep's remarks and the responses to them, and this has also dominated popular responses, generating what the BBC has characterized as a "firestorm on Twitter". Donald Trump responded to Streep's comments on Twitter, describing Streep as "one of the most over-rated actresses in Hollywood" and a "Hillary flunky", and stating "For the 100th time, I never "mocked" a disabled reporter (would never do that) but simply showed him "groveling" when he totally changed a 16 year old story that he had written in order to make me look bad. Just more very dishonest media!" Lorenzo Soria, president of the Hollywood Foreign Press Association (HFPA) which runs the annual Golden Globe Awards ceremony, wrote on Twitter on 10 January: "As an organisation of journalists, the HFPA stands by your defence of free expression and we reject any calls for censorship". 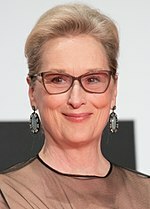 Dana White, president of the Ultimate Fighting Championship, responded to Streep's reference to mixed martial arts (MMA), defending the sport as an art, and saying that "the last thing I expect is for an uppity 80-year-old lady to be in our demographic and love mixed martial arts". Scott Coker, president of Bellator MMA, also defended MMA as art, and highlighted the sport's diversity; he invited Streep to attend an event. Tom Hiddleston received criticism in social media for mentioning that Sudanese medical workers had "binge-watched" The Night Manager, while accepting the award for Best Actor – Miniseries or Television Film. He apologized after the ceremony for his "inelegantly expressed" remarks. 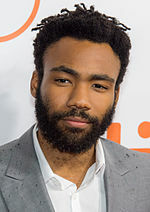 Richard Lawson, reviewing the ceremony in Vanity Fair, stated that Jimmy Fallon's opening homage to La La Land began as "a fun, starry sampling of this year's nominees", but had "worn out its welcome" before the end. Lawson described Fallon as an "oddly tone-deaf" host, and criticized his opening speech: "The jokes were stale and wheezy and Fallon’s lovable-cute shtick was more wearying than it was charming." He praised Kristen Wiig and Steve Carell's introduction to the Best Animated Feature Film award as "hilarious ... weird, inspired, clever without smirking". The Guardian's film critic Peter Bradshaw expressed disappointment that La La Land's success "shut out a lot of contenders that are now in danger of being forgotten and losing momentum", particularly highlighting Nocturnal Animals and Moonlight. 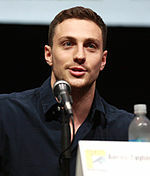 He praised Isabelle Huppert's win for Best Actress in a Motion Picture – Drama, calling it "the most extraordinary award". The ceremony averaged a Nielsen 5.6 ratings/18 share, and was watched by 20.02 million viewers. The ratings was an eight percent increase from previous ceremony's viewership of 18.5 million, becoming the third highest in a decade. 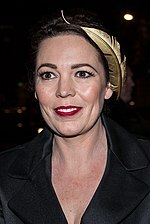 ^ The other six were Doctor Zhivago (1966; 5/5), Love Story (1971; 5/5), The Godfather (1973; 5/5), One Flew Over the Cuckoo's Nest (1976; 6/6), A Star Is Born (1977; 5/5), and Midnight Express (1979; 6/6). Parenthesis includes the year they were awarded, and number of nominations and wins. ^ Celada, Luca (April 18, 2016). "We Have a Date - for the 74th Golden Globe Awards!". Golden Globes. Retrieved August 2, 2016. ^ Bahiana, Ana Maria. "Our Host for the 74th Golden Globe Awards: Jimmy Fallon". Golden Globes. Retrieved August 2, 2016. ^ Moylan, Brian. "Jimmy Fallon a change in direction for Golden Globes hosting gig". The Guardian. Retrieved August 2, 2016. ^ Gonzalez, Sandra. 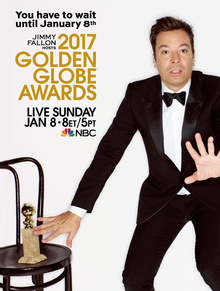 "Jimmy Fallon to host 2017 Golden Globes". CNN. Retrieved August 2, 2016. ^ McNary, Dave (June 16, 2016). "The Hollywood Foreign Press Association has announced the timetable for the 74th annual Golden Globe Awards, starting with an Oct. 31 deadline for submitting nominations". Variety. Retrieved August 2, 2016. ^ "Meryl Streep:The Recipient Of Our Cecil B. deMille Award 2017". HFPA. November 3, 2016. Retrieved November 3, 2016. ^ "Golden Globe Awards Trivia". Golden Globe. Retrieved January 8, 2017. ^ "'La La Land' breaks record for most Golden Globes won by a movie". LA Times. January 8, 2017. Retrieved January 9, 2017. ^ "'La La Land' Won More Globes Than Any Other Film, Ever". The Huffington Post. 8 January 2017. Retrieved 9 January 2017. ^ "'La La Land,' 'Atlanta' Win Big at 2017 Golden Globes". The Rolling Stone. 8 January 2017. Retrieved 9 January 2017. ^ "La La Land wins record seven Golden Globes as Moonlight takes best drama". The Guardian. Retrieved 9 January 2017. ^ "Golden Globes: 'Elle' Wins Best Foreign-Language Film". The Hollywood Reporter. Retrieved 9 January 2017. ^ "Isabelle Huppert Wins Golden Globe for Actress in a Drama for 'Elle'". Variety. Retrieved 9 January 2017. 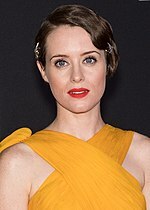 ^ "Golden Globes 2017: The Night Manager and The Crown lead TV award winners". BBC. Retrieved 9 January 2017. ^ "2017 Golden Globes: full list of nominations". The Guardian. 12 December 2016. Retrieved 13 December 2016. ^ "Golden Globes 2017: Complete list of nominees". Los Angeles Times. 12 December 2016. Retrieved 13 December 2016. ^ a b c Richard Lawson (8 January 2017). "Jimmy Fallon Makes for an Oddly Tone-Deaf Golden Globes Host". Vanity Fair. Retrieved 11 January 2017. ^ Suzanne Moore (9 January 2017). "The fightback against Trump starts with Meryl Streep's Golden Globes speech". The Guardian. Retrieved 10 January 2017. ^ a b Elahe Izadi; Amy B Wang (9 January 2017). "Meryl Streep called out Donald Trump at the Golden Globes. He responded by calling her 'over-rated.'". The Washington Post. Retrieved 10 January 2017. ^ "The best quotes from the Golden Globes 2017". The Guardian. 9 January 2017. Retrieved 10 January 2017. ^ a b c "Dana White attacks 'uppity 80-year-old' Meryl Streep over MMA comments". The Guardian. 9 January 2017. Retrieved 10 January 2017. ^ "Donald Trump calls Meryl Streep 'overrated' after Golden Globes speech". BBC. 9 January 2017. Retrieved 10 January 2017. ^ "Streep v Trump row sparks firestorm on Twitter". BBC. 9 January 2017. Retrieved 10 January 2017. ^ Andrew Pulver (9 January 2017). "Donald Trump calls Meryl Streep 'over-rated' after Golden Globes speech". The Guardian. Retrieved 10 January 2017. ^ "Tom Hiddleston apologises for 'inelegant' Golden Globes speech". BBC. 10 January 2017. Retrieved 11 January 2017. ^ Peter Bradshaw (9 January 2017). "La La Land's landmark haul is lovely, but expect more drama at the Oscars". The Guardian. Retrieved 10 January 2017. ^ "TV Ratings Sunday [updated]: Golden Globes up a little vs. last year, big NFL bump for FOX". Rickey Porter. Tvbythenumbers. January 11, 2016. Retrieved January 10, 2017. ^ "Golden Globes Ratings Rise Slightly From 2016 In Final Numbers – Update". Dominic Patten. Deadline. January 9, 2016. Retrieved January 10, 2017. ^ Michael O'Connell (January 9, 2016). "TV Ratings: 2017 Golden Globes Climb to 20 Million Viewers". The Hollywood Reporter. Retrieved January 10, 2017. Wikimedia Commons has media related to 2016 Golden Globe Awards.